I promised myself that if I ever started a new blog post it would be about one of my former students, Aaron Swanson. 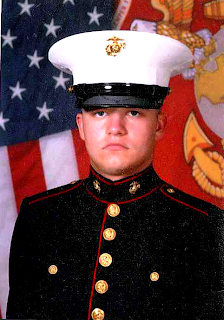 I never knew Lance Corporal Aaron Swanson. I knew a kid who sat in my JCC Stats class at Southwestern. A kid who was quiet, sneaky smart, and had a great personality. Actually, he reminded me a bit of....me! However, did I give him appropriate attention and focus? Maybe not. He was never the squeaky wheel, at least not that I remember. Aaron could figure things out on his own, he was quiet and never asked for anything. He was killed in the line of duty on February 7th, 2011 in Afghanistan. Since I've been out of teaching for a few years I've had some time to think about my time in the classroom. I hope that the lives I've touched will think about these times positively. I hope Aaron did. When we moved to Allegany after I took my current CABOCES job I remember the night I wandered into the living room to hear the local news stating that a local warrior was lost. Then, they showed the picture and name of Aaron Swanson and my heart sank. How sad. Did I even remember meeting his parents? What were they going through? I wonder how much we realize in education the lives we touch and our effect on young kid's lives? Thank you Aaron Swanson for all you've done for our country and for me.